I invite you to explore and encourage you take a moment to learn about the heritage of the crone. While you're here, also check out croning ceremonies, which is a way to honor and celebrate the wisewoman in yourself and the wisewomen in your life. My desire to heighten awareness and remove the mystery of the crone and the croning ceremony was the inspiration for establishing this website and to write the book, Midlife Musings: Creative Croning Ceremonies. Those who want to honor their life's journey through this unique and spiritually meaningful rite of passage will find a lot of great information all in one place. I've done all the work so you don't have to! I sincerely hope the ideas and gifts I offer here will inspire, intrigue and delight you. It's as important to me to share my ideas and gifts with you as it is to guide you on a path of self-discovery that leads you to appreciate who you are, and are becoming. To crones and wisewomen around the world, let's celebrate! 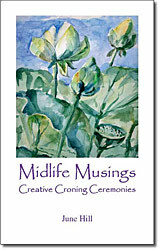 Midlife Musings-Creative Croning Ceremonies - click on the image to purchase.